Few days behind in getting this posted. Brisan on Jan. 10th had an Ileostomy bag placed to help reduce the distention in his colon/ bowels. I can't think of a better way to sum up everything than by posting Jennifer's updates from Facebook. 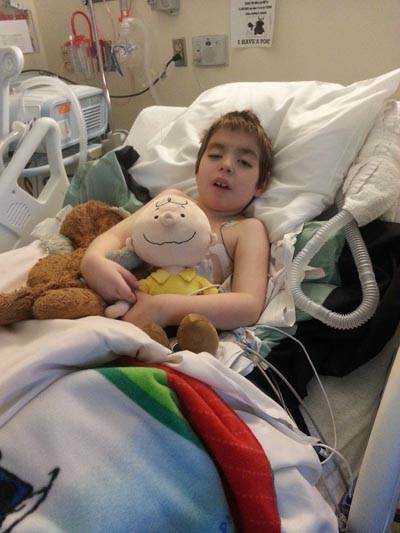 Brisan is all settled into his room and doing well. He chose to be weaned off of the ventilator on his own so he is now off and got to be extubated! He's been awake off and on and his color and lung volumes are some of the best I've seen in over 4 years. Plus since we're not worried about gut motility he can have morphine again. He has had some vomiting and seizures but that's to be expected since he just had a major surgery. Thanks for all of the prayers and keep them coming. Brisan update: so he's doing okay. Had fevers off and on all night and today. His BP is holding it's own but it is trending down. But he has an art line so we can monitor that better and more accurately. He is getting his pain meds scheduled but for some reason is very restless and hasn't slept at all. 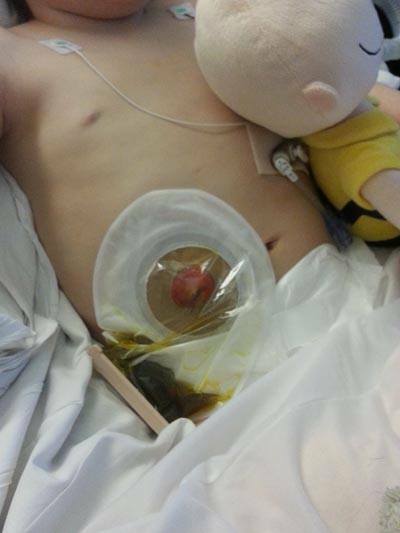 His new stoma is okay and from what we can see the bleeding has stopped. So now we are just trying to get him some rest. Brisan Update: So Brisan is out of PICU and on the floor. He's having some pain management issues and possible withdrawals. This am we had a scare. He started coughing and his O2 dropped really low and wouldn't come up. So after some cough assist, breathing treatments and a chest xray he's back on oxygen and getting more pain meds. Waiting for Dr to come back to see what plan is. Brisan Update: so he's been holding his own. He's had some de-sat issues but that we can work with. His new “bag” is working great and is already producing. I got training on how to change his bag today and Bri seems to not mind it. His life is drastically changed since the surgery. Thanks to everyone who has textex, emailed, called and prayed for Bri and our family.